This week we take a look outside the water sports industry and spend five minutes with Skydive Tandem Master, Drop Zone Manager and a Pilot- Elliot Clark. How long have you been living and working in Interlaken? I’ve been working in Interlaken since 2000. Interlaken. I met my wife here and we have two kids now. Almost English and terrible German. My wife is from Germany so my kids speak better German than I do now. How did you become a tandem master and a pilot? I started with skydiving in 1988 in England and it became my passion. I have about 10 000 skydive jumps and about 180 base jumps on my list. I used to wash insides of the trash cars back in Chelsea. It was a 3 month terrible job, but I needed extra money for skydiving. California, California and California. There is everything! Sun, beaches, surfing, mountains, deserts and great skydiving too. The extensive variety of adrenalin sports available for general public in summer and winter. Apart from working for Skydive Switzerland, what is your favourite thing to do in Switzerland? I work a lot, but when I don’t, I enjoy time with my family and skiing in the winter. Have you ever had someone famous skydiving with you? Marc Rosset, former famous Swiss tennis player. I was in the team for the British Record Formation Skydive of 100 jumpers. 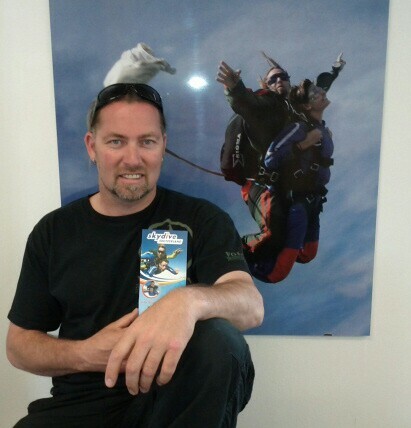 Where else in the world have you skydived? USA - California, Florida, Arizona, Switzerland, Germany, England, Canada, South America, Venezuela and I have great memories of base jumping in Norway. I like meeting new people every day and our team is like a really tight group of friends who laugh all day. Although it is Sunday I need to finish some office work, then probably a pizza with my family.